You HAVE to eat these!! It's no secret that I hate being gluten-free. I hate all of the substitutions and I despise GF bread. It sticks to my teeth. However, this is the *first* gluten-free bread food that I've eaten and liked. Not even just liked... loved. I *really* love them! They are so good. My husband was devouring them as well. I adapted this recipe from the back of a Bob's Red Mill bag. This recipe was originally for banana bread and I was pretty excited to make and eat it. 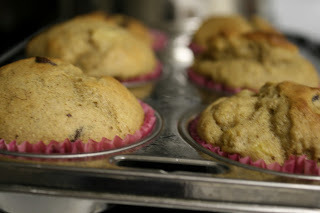 However, I couldn't find my loaf pan, so I decided to turn it into muffins instead. 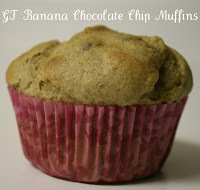 Also, I made several alterations + substitutions to the recipe because I just can't help myself. It turned out really well though, so it was for the best! (1) Mix it. First, stir the applesauce, eggs & extracts together. Next add in the flour, xanthan gum, salt, baking powder and spice. 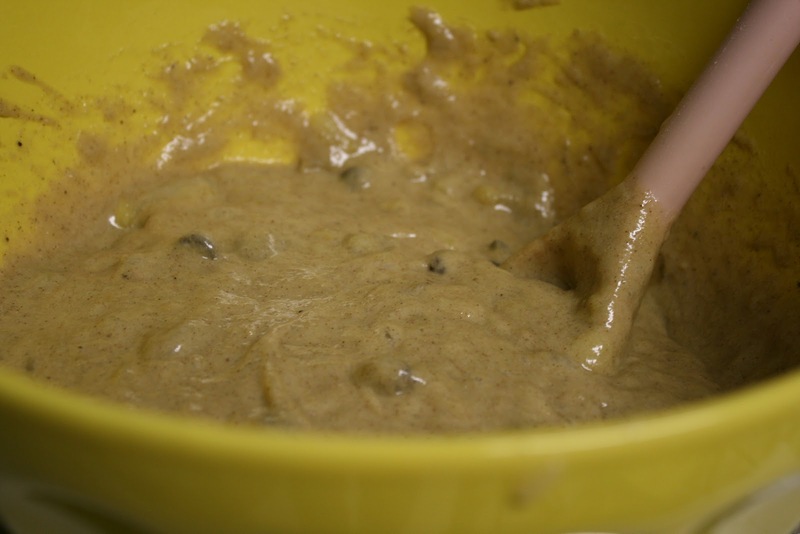 Mix in the mashed banana. Add in the chocolate and raisins (optional). (2) Pour it. Be sure to grease your pan and then fill it up! 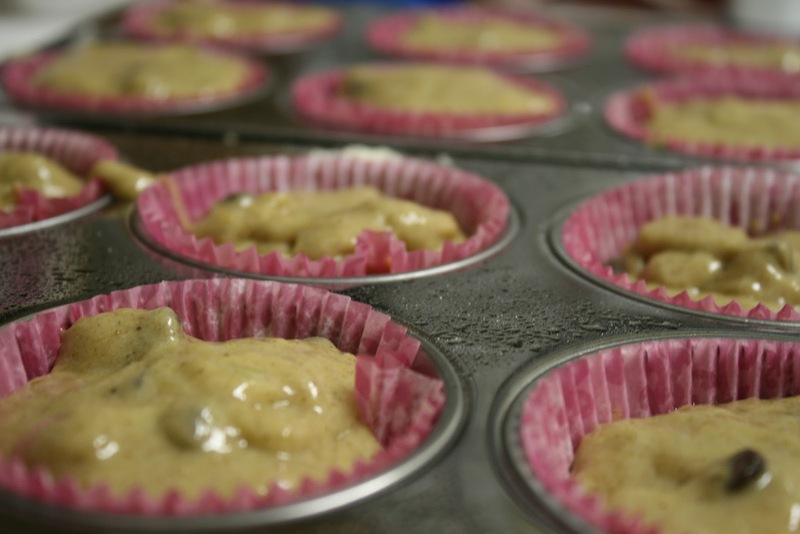 There should be enough batter for 12 muffins or one loaf. Fill the cups to nearly full. (3) Bake it. For the muffins, bake them at 350 for 25-30 minutes. For the bread, bake it at 350 for an hour. Remove them from the oven and allow them to cool on a wire rack. I ate my first one while it was PIPING hot. So good. I *promise* that you will enjoy these muffins. They are so awesome. We stored ours for 3-4 days in an airtight container and they kept just fine. 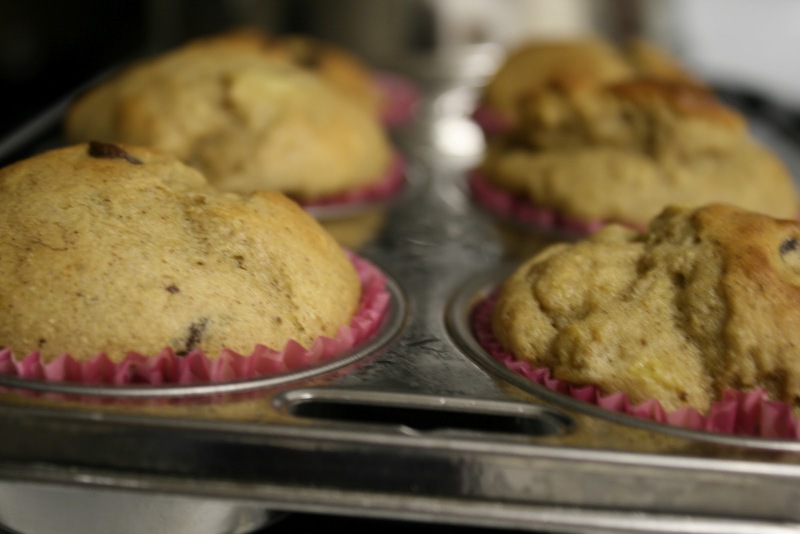 GF baked goods tend to get a little watery when stored, so you may want to reheat them before eating. Try popping them in a toaster oven for a minute or two to warm them up. I ate mine as they were and they were awesome, though. Now it's time for French lessons! One of my favorite parts of the week. My beautiful ballet instructor is also my brilliant French student. That means I need to finish up this awesome Michigan salad at my favorite little cafe and get moving! Have a wonderful weekend, and as always, thanks for reading!